This was one of the sensations of 2017, and was the closing film of the Leeds International Film Festival. It also won the Oakwood Cinema ‘audience choice’ vote earlier this year! 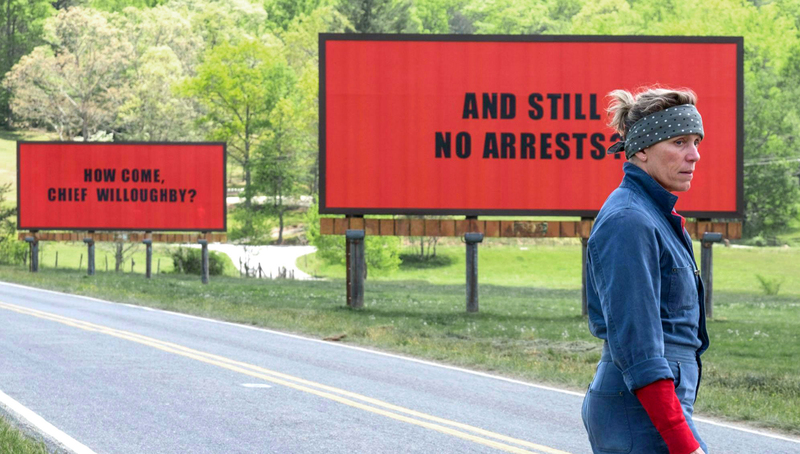 Three Billboards is an unusual film; it deals with murder, revenge, grief and loss, as well as police violence and racism, but it is also darkly comic. It contains some excellent performances, particular the three main protagonists: Frances McDormand as a woman who takes matters into her own hands after the murder of her daughter, Woody Harrleson as the local police chief, and Sam Rockwell as a singularly incompetent and violent police officer. McDormand and Rockwell deservedly got Oscars for their work, and McDormand (who many of you will know from her many films with the Coen Brothers) offers a challenging and unsentimental view of how a grief-stricken mother ‘should’ behave. She is not particularly empathetic but yet we feel her pain. If this all sounds rather grim, it isn’t. This is largely due to the work of the British writer and director Martin McDonagh, who is best known for In Bruges (2008) – another very black comedy. His script is razor sharp, with great one liners and plenty of plot twists and surprises. McDonagh won two Golden Globes and two BAFTAs for the film and the script. Doors 7:00 Movie 8:00. Tickets £5 Members £4.